Today’s tasting notes: Dunno. Haven’t tasted it yet. Today’s thoughts: I love Star Wars. Since I wrote about that life-long affection a year ago, I’ll focus on something else this time. The salient point to bring forward is: I waited 32 years* to know what happened to those beloved characters. When The Force Awakens hit theaters two years ago, I was anxious as hell about seeing it, wanting to have hope, but fearing another heartbreak a la The Trilogy of Which We Do Not Speak. I left that theater feeling renewed hope for the future. Of Star Wars, anyway. Last year’s Rogue One was also good, but my excitement for a prequel, even a good one, will never match my interest in the futures of Luke, Leia, R2, Threepio, Chewie … and Rey, Finn, Poe, and BB-8. Tonight The Empress of Whisky and I see The Last Jedi. She enjoys the films, and we have had tremendous fun at the last two opening night events, but there is, shall we say, an enthusiasm gap. She would, for instance, be happy waiting as long as tomorrow(!) to see this film. But she indulges me, even when, as it so happens tonight, the occasion falls on, for example, our anniversary. Twelve years she’s been indulging me. That’s pretty good, no? In celebration of which she gave me the whisky above, which is as old as our relationship. Pretty good thinking there. We’ll open the bottle tonight, at home, and discuss the movie over a dram. Today’s note on sharing: I think it’s worth considering just how much better life is because we’re in it together. I do, in fact, consider this all the time. Today’s toast: To my love: May the Force be with you, always. Me, too. ** — No Star Wars. Nope. You imagined that other trilogy. You must have been on a bender. Bad you. Today’s tasting notes: Yesterday, all I gave you on this whisky was: “It’s all peat and brine, and I rather enjoy it.” That’s more or less accurate, but I’d add that it also contains a hint of smoke, and I’d defined the brine as mild in nature, just enough to let you know the whisky was born on an isle. Today’s thoughts: As I mentioned yesterday, I opened my bottle of Talisker Storm in the company of friend who likes whisky and board games. The photo accompanying this post was taken in early October this year, on that very occasion. You’ll note the game is called Isle of Skye, and whether you believe me or not, we didn’t plan this. I mean, we planned to play board games that day, and whisky is usually an accompaniment for that, but I didn’t know my friend was bringing Isle of Skye, and he didn’t know I was holding a bottle of Talisker Storm in want of inspiration to be opened. Kismet. Speaking of kismet, I don’t believe I’ve ever relayed here the story of how I met the woman I would later dub the Empress of Whisky. I was out to dinner to my favorite pub when I encountered a friend who was playing cards with three other people I did not know. We exchanged pleasantries before I settled at my own table. Not long after, he popped over to ask if I would be interested in joining the game, as one of the four players had to unexpectedly leave. As this was a game played in partners, they needed a fill-in player to finish. The woman I was thus introduced to as a game partner would end up being a far more long-time companion. While we played cooperatively (and ultimately victoriously) that day, we are not at all opposed to being adversaries. Outside the game, we love each other. Inside the game, no quarter is given. Today’s note on repetition: One of the things you’re likely to learn early on the journey to whisky appreciation is to never judge on the first sip. That one will usually burn a bit, and you need to let your palate adjust before sipping again to get a better assessment. Games can be like that, too. This is why the Empress and I generally play each new game at least twice in a row. That, and the loser can never wait for a rematch. That’s true whichever of us happens to have lost. On this lovely post-post-snow day, we’ve been facing off in various new board and card games. I would like to tell you that I have triumphed consistently. So would she. We’re both right, depending on the game in question. At least the loser has whisky. Then again, so does the winner. Today’s toast: To the Empress of Whisky: I love you. Outside the game. Today’s tasting notes: Jameson is smooth, rich easy-drinking Irish whisky. This stuff? Head of the class. It has almost no rough edge to it. Gently sweet. The body is light if you’re used to single malt Scotch whisky, but it’s in the medium range for Irish whisky. Why this dram tonight? Faraway friends are on my mind. I’ll leave it at that. Today’s maudlin notation: Hug the ones you love, and don’t put off taking that trip to see them (or saying yes when they ask to visit you). Today’s toast: To all I hold dear, but especially those not near: Be well. I love you. Today’s tasting notes: Do not drink this if you do not enjoy smoke and peat. Seriously, probably don’t even sniff it. 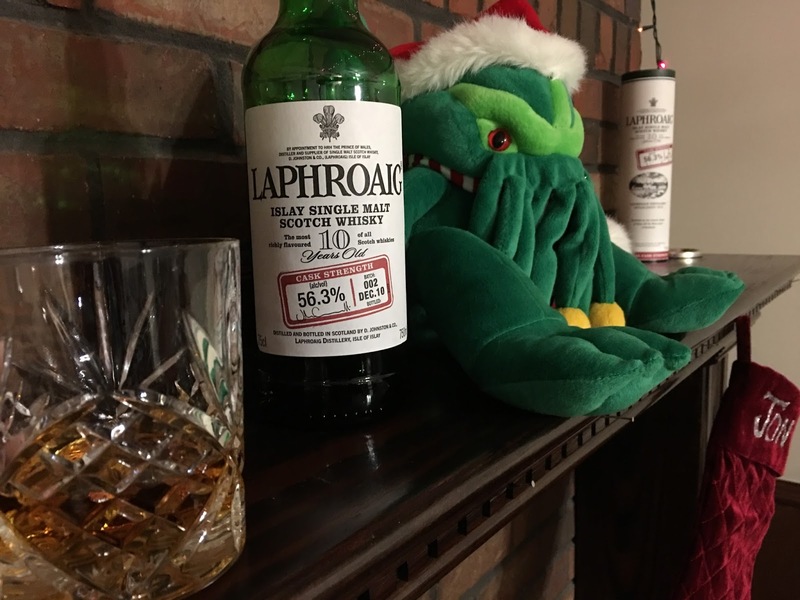 If you’ve had Laphroaig before, you know its reputation as the smokiest, peatiest of all the notoriously smoky, peaty Islay malts. The cask-strength version is essentially the dire, half-dragon version. Do not attempt if below Scotch Whisky Character Level 10. Today’s thoughts: My wife gifted me this bottle for a birthday a few years ago. Once, maybe twice a year I pour myself a wee dram and savor it for the smoky, peaty punch in the mouth it is. My wife I appreciate every day of the year. For her strength and compassion. For her humor and insight. For the support she lends me, in ten thousand little ways, from one day to the next. It’s no exaggeration to say I wouldn’t be who I am without her. Life is better as a great adventure, together. Or, to put it another way: my favorite whisky is like my favorite person: strong as all hell. It’s embarrassing how little I remember sometimes. I have an English degree, and the head full of dusty literature that comes with it, but all too often I fail to recollect the lines I need to recall, when I need to recall them. Others stick forever with me, even if the context of their origin is sometimes fuzzy. That’s a line from the poet Bin Ramke, best I remember it, from his work “When Culture Was Popular,” which is part of his anthology Massacre of the Innocents. I met him, somewhere along 1997 or so, shortly after that was published. He spoke to an advanced creative writing class I was part of, only a dozen or so students, and we sat in a coffee shop and asked endless questions about his work, his process, hoping, each of us, to capture some bit of magic from this master in our midst, each still sheltering at least some fragment of a dream that we could be the sort of practitioner he had become — stable, employed, respected. Any two of those, maybe. Hell, one, so long as it was part of an existence as a writer. I don’t have to tell you I’m one of the ones who didn’t make it. That sort of statement is redundant to tell someone who has made it here to this neglected little spot online. These days the very best lines of poetry I make — any writing at all, really — stay in my head for the little bit of time they last before I dismiss them, usually before even approaching a writing implement. But that part of the dream is as lost as the rest of it, and I just sit here wondering what any of it matters, anywhere, anymore. I am tired of the sound of history, and I do not remember what I love anymore … but I am trying, I am here today, trying, to remind myself. Unless, that is, what you really want is something shiny/red/floral/chocolatey, in which case, have it. If, on the other hand, you’d prefer, why not something personal? My wife and I celebrated this day eight years ago with a full-on Thanksgiving-style turkey dinner, and that remains my favorite Valentine’s Day observance so far. We didn’t even call it Valentine’s Day; we called it Day [#], where [#] was the number of days we’d been together as a couple. Every Feb. 14 since, we’ve observed Day [#] basically the same way. In so doing, we took something general and made it something mostly our own. I say “mostly” because, of course, we are still hewing to a date on a calendar, even if we call it by another name. Mind you, when a random July day rolls around and a turkey dinner sounds wonderful, Day [#] is there for us, too.